Many development projects lack data to support their implementation. This does not mean that the projects are not having a positive impact. It could simply be that the data is harder to collect than the project is to implement. After all, for us to know how much water our windmill is pumping we would have to sit and watch it 24/7. It's just not feasible. Or it wasn't until now. Our demonstration windmill, which has supplied more than one million liters to the garden, is under its own trial to produce data that can be used for redesign and replication. 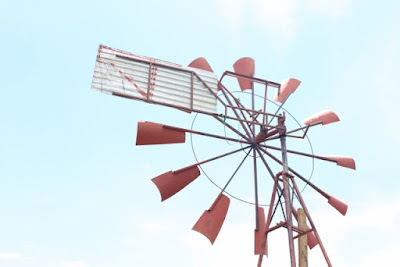 One of the challenges is to understand the behaviour and performance of the windmill over a long period of time, without constantly having to be present at the garden. 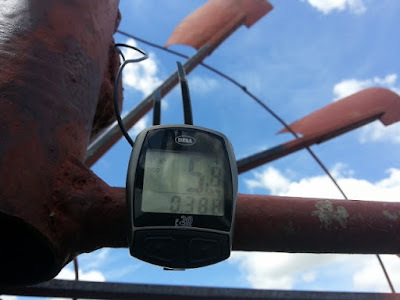 To address this, we have modified a bicycle odometer to record data in real time. On a bicycle, the computer takes input from a magnetic sensor that signals every time the magnet on the spokes goes around one revolution. It is essentially recording RPMs and converting that to distance and speed. 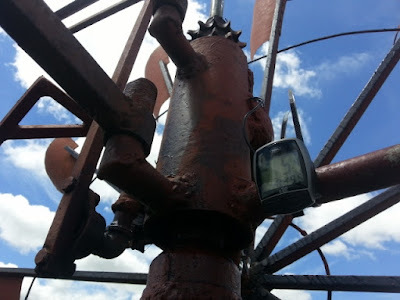 We have adapted the computer to record RPMs on the windmill. 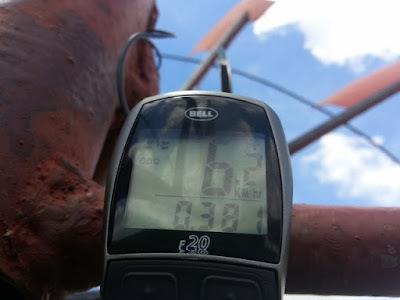 First, the windmill's RPMs are usually much slower than a bicycle's, so instead of one sensor, we use 6 evenly spaced around the spokes of the windmill. Now the sensor can pick up much slower speeds, but we have to divide all of our measurements by 6. Next we record the distance, speed, and "trip time", from the computer. Distance corresponds directly to number of rotations. In this case, we use an input tire circumference of 1,667mm in the computer. This yields approximately 100 rotations per kilometer. We can also convert the speed to RPMs. That is, 1 kilometer per hour is approximately 1.67 rotations per minute. The "trip time" simply let's us know how many hours the windmill was moving since the last time we recorded the data. The piston pump driven by the windmill falls into a category of pumps called "positive displacement pumps", or PD pumps for short. The important thing about PD pumps is that their output is in direct linear proportion to the cycle rate of the pump. (This is in contrast to a centrifugal pump which has a diminishing return on increasing speeds beyond its intended speed). We can convert the RPMs to pump output by multiplying the RPMs by the displacement of the piston. In our case, each stroke of the pump displaces 1.13 liters. So, 1 kilometer per hour is equal to 1.67 RPMs, which is equal to 1.88 liters per minute. Our goal is to maximize the amount of water pumped. 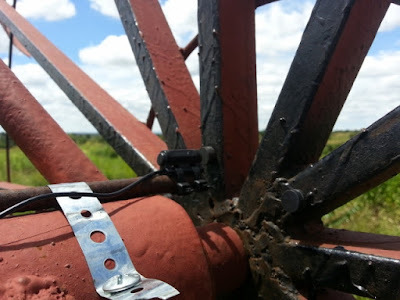 When we make modifications to the windmill, we observe changes in the average output and up time. For example, if we decrease the pump displacement, we would expect to see average speed and "up time" increase because there is less resistance. We can now see if these increases are enough to overcome the loss of displacement to pump more water overall.